Supplemental notary stamps are wonderful and helpful tools for both experienced notaries as well as for novice notaries. Regardless of how long you have been notarizing documents, it is imperative that you are well-equipped and knowledgeable. Some documents may or may not have the pre-printed notarial verbiage needed for the type of notarization. For an acknowledgement notarization, you must confirm the identity of the signer and that it is truly their signature that appears on the documents. After confirming the signer's identity, your state may require you to note that you have correctly identified the signer. If the verbiage is not pre-printed on the document, you may have to write it out. To avoid writing out the correct verbiage or risk being unprepared, we have created the MaxLight X Notary Acknowledgment Stamp. Unsure if the Acknowledgement is acceptable in your state? Contact us! The MaxLight X Notary Acknowledgment stamp is an eco-friendly option when purchasing notary supplies. 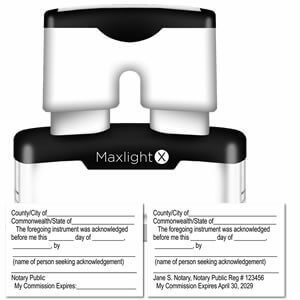 Our MaxLight X Notary Acknowledgment stamp is made by a low emission flashing process and is guaranteed to give that extra professional touch when notarizing documents. The MaxLight X Notary Acknowledgment stamp has a built-in ink well which can easily be re-inked and does not require the use of additional replacement ink pads. Simply press the uniquely designed handle and you will receive a quality impression every time.